Hot on the heels of his latest "Yuck Fou" album on the mega Roc Nation label, and massive tour of the same name Jarren Benton is heading to Australia for his first headlining tour down under thanks to Delta Bravo Presents. Benton was last seen in Australia in 2015 on the Funk Volume Tour with Hopsin, Dizzy Wright, & DJ Hoppa. 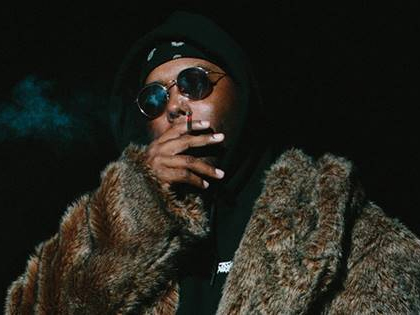 Four years after being voted in by fans as the People's Choice selection for XXL's 2014 Freshman Cover, Jarren Benton is re-emerging as a star on the Roc Nation label. Now a seasoned vet, Jarren is doubling down on the lyricism he made his name on, coupled new musical experimentation and new emotions. In 2012, the Atlanta based emcee began making a name for himself on the outsider indie label Funk Volume, where he carved out a unique brand of ferociously lyrical, tongue-in-cheek horrorcore. Benton's time with Funk Volume was punctuated by a debut album (My Grandma's Basement), national and international tours, and then, in 2016, the label suddenly folded. Benton's new music also looks ahead by nodding back, rekindling a working relationship with his long-time producer Kato"the executive producer of "Yuck Fou" " and throwing his styles in a blender: part lyrical attack, part journal-like reflection, still a little disturbed. Benton still has a flair for the dramatic, but instead of raps that brood with bitter reflection, he sounds like he's having fun again. Benton borrows a radio-friendly flow to charm his way into the door and detonate the party with a twisted eccentricity. Now it's your chance to XXL's 2014 Freshman Cover Star Jarren Benton heat up Australia's stages and he is ready to give you give you a big "Yuck Fou"